In a dynamic photojournalistic essay that traces the long love affair between Cubans and the U.S. automobiles, the author offers a paean to the extraordinary people who keep their weary classic American cars running with resourcefulness, ingenuity and indefatigable good humor. Cuba Classics: A Celebration of Vintage American Automobiles captivates everyone from armchair travelers to classic car connoisseurs with powerful imagery that reflects the beguiling other-worldly charm of Cuba, the Caribbean’s most compelling and intriguing isle. 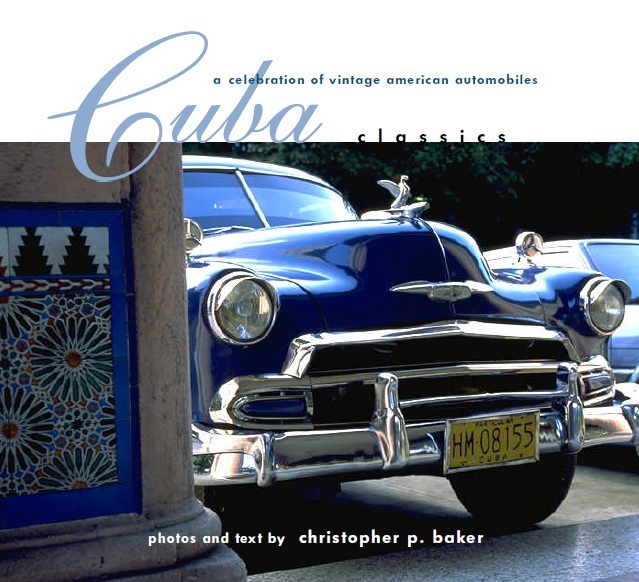 From Model-T Fords and ‘40s-era Buick Roadmasters to late ‘50s Edsel Citations and Chevrolet Impalas with fins sharp enough to draw blood, Christopher P. Baker’s Cuba Classics evokes the nostalgia and seductive world of Cuba’s car culture. Blurry actions shots of moving cars. Close-up details of hood ornamentation, grillwork, and dashboards. And lavish landscapes that place the beloved cacharros within a setting both sensual and surreal. All these images are complemented by extensive captions that illustrate the subject magnificently. Written in the lively, engaging style that has won the author numerous literary awards, the evocative text also proves both absorbing and richly entertaining. Baker draws upon memoirs, museum records, personal interviews, and Cuba’s own dusty archives to celebrate the four-wheel survivors of a bygone age and the passion of their owners. Tracing the evolution of motor madness in decadent pre-revolutionary Cuba, Cuba Classics surveys the tough realities of caring for vintage cars in the modern age of embargo and shortages. These challenges have produced exceptional skill and inventiveness among the owners and mechanics who somehow keep their gas-guzzling leviathans on the road.